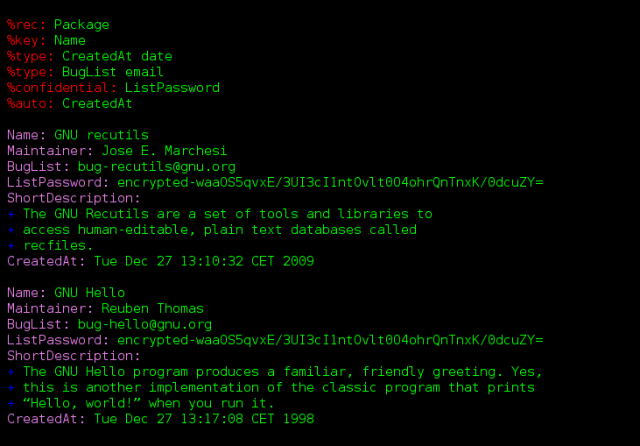 GNU Recutils is a set of tools and libraries to access human-editable, plain text databases called recfiles. The data is stored as a sequence of records, each record containing an arbitrary number of named fields. The picture below shows a sample database containing information about GNU packages, along with the main features provided by recutils. A video with a talk introducing the program can be found here. If you want to discuss recutils, some of the people involved in GNU recutils hang out in the #recutils channel in the irc.freenode.net IRC network. You are more than welcome to join. Unique fields and primary keys. Predefined: integer, real, date, etc. User-defined: based on regular expressions. Selective: individual fields can be encrypted. Navigation mode and editing mode. Visual edition of fields driven by types. Read data from recfiles into a table in an org-mode buffer in Emacs. Full description of the format. Rich set of utilities to be used in shell scripts and in the command line. GNU recutils can be found on the main GNU ftp server: http://ftp.gnu.org/gnu/recutils/ (via HTTP) and ftp://ftp.gnu.org/gnu/recutils/ (via FTP). It can also be found on the GNU mirrors; please use a mirror if possible. Additionally there are binary packages for some GNU/Linux distributions. If you know of some other binary distribution of GNU recutils please get in touch with the maintainer. Take a look to our Frequently Asked Questions section. Documentation for Recutils is available online, as is documentation for most GNU software. You can find more information about Recutils by running info recutils or by looking at /usr/doc/recutils/, /usr/local/doc/recutils/, or similar directories on your system. GNU recutils has two mailing lists: <bug-recutils@gnu.org> and <help-recutils@gnu.org>. The main discussion list is <bug-recutils@gnu.org>, and is used to discuss most aspects of recutils, including development and enhancement requests, as well as bug reports. There is a separate list for general user help and discussion, <help-recutils@gnu.org>. Announcements about Recutils and most other GNU software are made on <info-gnu@gnu.org>. Development of Recutils, and GNU in general, is a volunteer effort, and you can contribute. For information, please read How to help GNU. If you'd like to get involved, it's a good idea to join the discussion mailing list (see above). Trying the latest test release (when available) is always appreciated. Test releases of Recutils can be found at http://alpha.gnu.org/gnu/recutils/ (via HTTP) and ftp://alpha.gnu.org/gnu/recutils/ (via FTP). For development sources, and other information, please see the Recutils project page at savannah.gnu.org. Please send bug reports and patches to <bug-recutils@gnu.org>. To translate Recutils's messages into other languages, please see the Translation Project page for Recutils. If you have a new translation of the message strings, or updates to the existing strings, please have the changes made in this repository. Only translations from this site will be incorporated into Recutils. For more information, see the Translation Project. Recutils is currently being maintained by Jose E. Marchesi. Please use the mailing lists for contact. Recutils is free software; you can redistribute it and/or modify it under the terms of the GNU General Public License as published by the Free Software Foundation; either version 3 of the License, or (at your option) any later version. Please send general FSF & GNU inquiries to <gnu@gnu.org>. There are also other ways to contact the FSF. Broken links and other corrections or suggestions can be sent to <bug-recutils@gnu.org>.